It's amazing how modern Ikat seems today when you consider it's history and how long its been around. Our Ikat fabric for upholstery is the perfect weight for many home decor needs, sofas, drapes, decorative throw pillows or curtains and more. Each colorful pattern we carry is durable and practical which makes sense. Ikat has a long tradition to maintain. Dimensions: 54" wide, fabric for upholstery. 100% cotton. 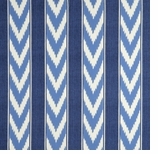 A Modern version of ancient Ikat fabric. See also our Suzani fabric and ready made Ikat pillows. 54" wide. 100% cotton. Treated for outdoor use. Repeat:Vertical 27", Horizontal 27". 54" wide. 100% poly. Treated for outdoor use. Repeat:Vertical 9", Horizontal 6.75". Even though decorators love Ikats, you don't need a decorator to buy it. 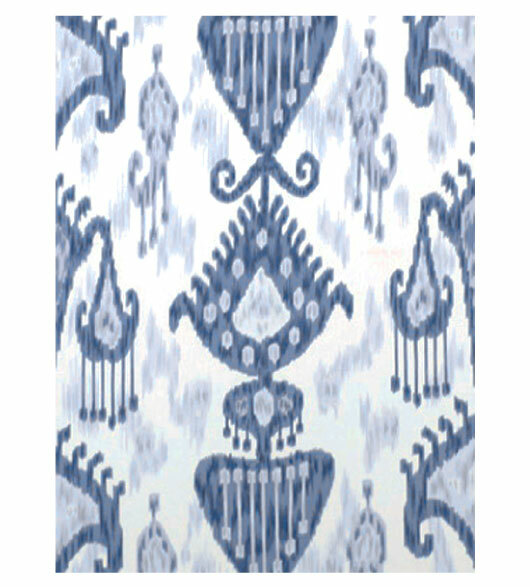 Ours Ikat decorative fabric is easy to work with for do-it-your-selfers. The blues are probably the most popular. Add some blue and white vases, an oatmeal colored rug and you have a great looking room to accessorize and decorate as you go. Carolyn Roehm likes blue and white decorating so much she wrote a book on the subject. 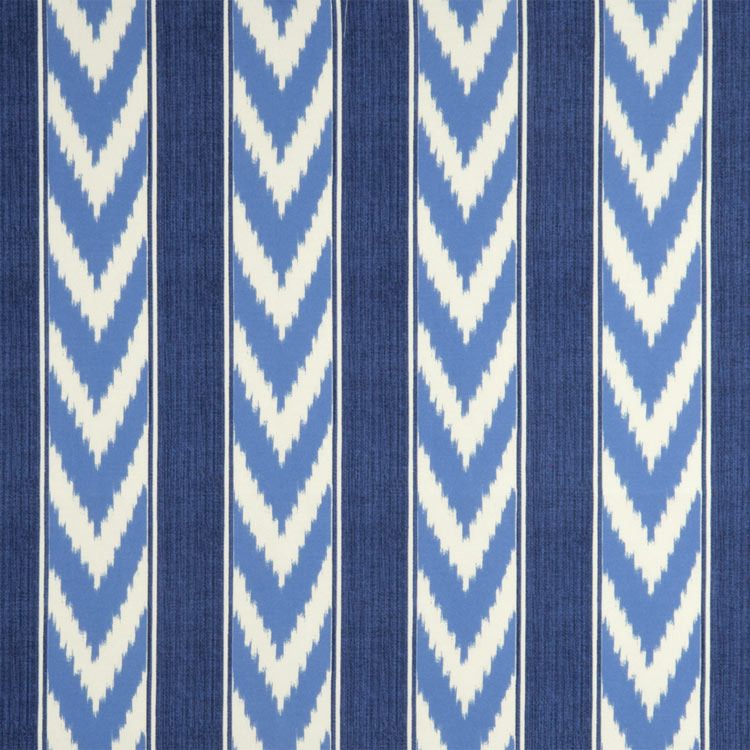 Roehm talks about "the whole spectrum of blues, from delicate sky to the deepest, boldest navy, evoking moods ranging from tranquil to vibrant....innovative use of these colors transforms bedrooms, baths, living rooms, dining rooms, gardens and other outdoor spaces." Red Ikat also makes an easy decorating scheme. As Diana Vreeland said, every room needs a touch of red. Remember Diana Vreeland's directive to her decorator Billy Baldwin. She wanted a "garden in hell." Baldwin did redo her now famous decorative fabric covered room. Red Ikat fabric is a modern way to do a red room, but it still has a classic feel. 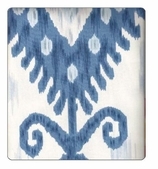 Use Ikat for a sofa or couch, curtains, drapes, decorative throw pillows, the works, to add pizazz to any room. In 2006, I was wandering thru the Metropolitan Museum's Michael Rockefeller wing filled with amazing relics from African safaris to stumble upon a History of Ikat show. There, among the masks and feathers and totems, was The Fabric of Life: Ikat Textiles of Indonesia.. I think my love affair with this textile started then and there. Even though our fabrics are designer fabrics, you don't have to be a Rockefeller or go to Africa to purchase them. You can read more about the show and see images from it at: Ikat Textiles of Indonesia. Another great museum of the decorative arts is The Victoria and Albert Museum in London. In fact, the "V& A" is widely known for its fabulous Textile Department. They have many Ikats and have documented the History of Ikat Fabric as well as the process of making Ikats. There have even been Ikat Forums to study the history of Ikats. Here's what Wikipedia has to say about Ikat Fabric. Because they have been around for so long, decorating with Ikat fabric is not new, even though it feels fresh and in style. Updated coloring and materials account for this. The Press is clearly crazy for the pattern. Decorating magazines hardly ever have an issue without a touch of it. 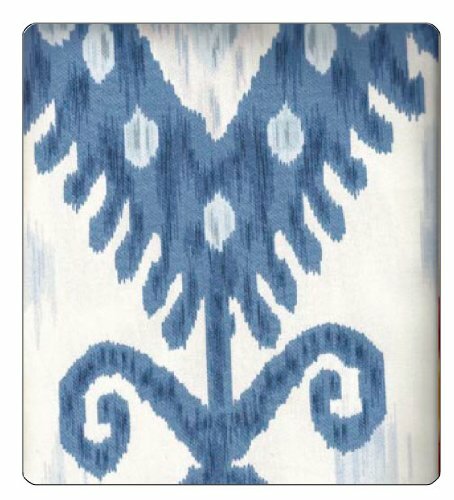 You can find guest towels, beverage napkins, mugs, trays, pillows, placemats and napkins and more on our site in Ikat prints. The pattern seems here to stay. It has become a decorating staple like stripes or dots, or animal prints. Estee Lauder's last giveaway bag was in the print. Blue and whites seem to be the most popular but red and white, beiges, browns, greens and chartreuses are available too. Take your pick and have fun mixing and matching this wonderful decorator design classic. See our info on how to measure fabric for upholstery, curtains, bedding.